See thae politicians at Westminster or Holyrood or wherever they are? They’re no even there, they’re up in space. See whit I want tae dae wi them? I want tae get them on the nummer 14 bus. In just a few words – 365 words to be precise – the writer James Robertson evokes the daily struggle played out on a bus ride through Scotland’s affluent capital. It could be a bus ride in any UK city. Briefly, vividly, he depicts the hardship and heroics of survival, the nitty gritty consequences of policy decisions taken in nearby Holyrood or distant Westminster. It takes a storyteller’s skill to animate the elderly couple with a compassion which is felt rather than spelt out: him a ‘big lang fellae’ her ‘aboot hauf his height’. Each gripping the other’s hand. But it takes only human empathy to understand the grinding toll of austerity, the double blow of cuts to benefits and council services. ‘We should put ourselves in the shoes of others.’ The message was quietly delivered by James Robertson at this year’s SURF (Scotland’s regeneration forum) conference Community-led regeneration: making it real. How to make it real when words like community become meaningless? Separating rather than uniting: Muslim ‘community’; gated ‘community’; ‘community charge’. James Robertson brought the day to a close with readings from his book 365 Stories. Writing a 365-word story each day for one year was a self-imposed task which had him seeking inspiration (sometimes near midnight) in his own experience. 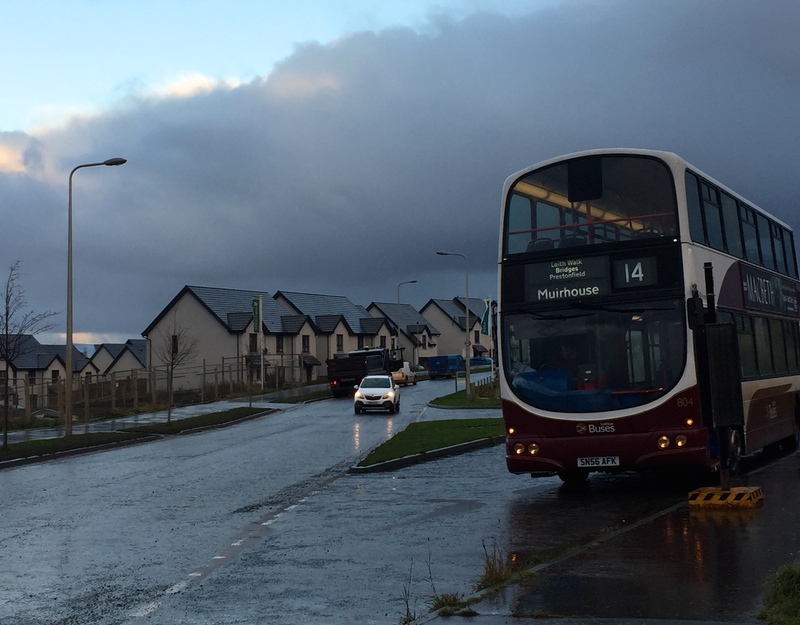 The number 14 bus stops near his home on its north-south journey from Muirhouse to Craigmillar. Will it echo again as the Scottish Parliament prepares to debate the 2019-20 budget? 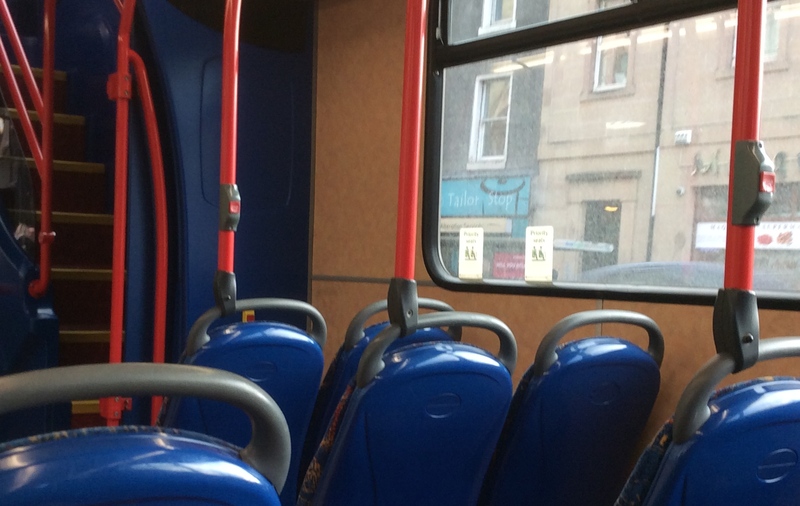 With Scottish council funding in the balance, every MSP should get on the bus. And stay on for ‘the haill bliddy route’. The Nummer 14 bus is reprinted here with the author’s permission. See thae politicians at Westminster or Holyrood or wherever they are? They’re no even there, they’re up in space. See whit I want tae dae wi them? I want tae get them on the nummer 14 bus. It should be obligatory. And no jist for a couple o stoaps. The haill bliddy route, start tae finish. It might jist make them realise they’re boarn. It might make them think twice aboot the guff they come oot wi. I doot it, but it might. That bus yesterday, I’m tellin ye, it wis even worse than usual. I’m no bein insultin. I’m no huvin a go at the folk on the bus or the folk on the street. I’m huvin a go at the politicians and their ‘somethin for nuthin society’, their ‘jist say no’ finger-waggin, their disability livin allowance reassessments and their bastartin bedroom tax. I’m hearin aw that in ma heid and meanwhile three seats ahint me somebody’s hackin awa like they’re gonnae drap deid and folk are gettin on and aff the bus wi sticks and Zimmers and buggies and ootside on the street there’s blin folk and puir folk and pechin folk and folk wi mental problems and folk in wheelchairs and a junkie in a doorway lookin like a loast bairn and black folk and white folk and aw they’re tryin tae dae is get through it, ken, aw they’re tryin tae dae is get through it and these politicians are zoomin aboot in their spaceships when they should be sittin on the nummer 14 bus seein whit it’s like. There wis this big lang fellae, he had hair like snaw, he wis haudin ontae his wife, she wis aboot hauf his height and every step he took it wis like a ship pitchin in the middle o the Atlantic Ocean. He wis grippin her haun and she wis grippin his and it wis like she wis his anchor but he wis draggin her through these forty-fit waves, every step wis anither monster wave but they were daein it, they were gettin through it, but the politicians wurnae on the bus so how could they see, how could they even imagine it? Brilliant – love it. A vivid picture of real life in words. It should be put up on a huge billboard right outside both parliaments. Thank You. Jesus. The new Kelman. what a story.